Del Rey's second novel of the Edge of Victory duology, written by Greg Keyes, was published on this day in 2001. The book is set in the era of New Republic and Jedi Order, headed by Luke Skywalker, and follows several different stories of characters such as Anakin Solo, Leia Organa Solo and Han. This novel is no longer considered canon in the newly created Disney and Lucasfilm readership canon. The 292-page book is one of a series of novels called The New Jedi Order, which was a multi-author book series published by Del Rey between 1999 and 2003. 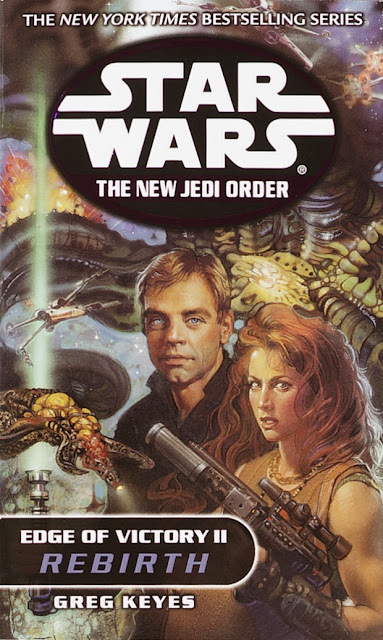 It consisted of 19 novels, three short stories and contributions from twelve different authors, which was a collaborative effort conceived by representatives of Del Rey, Lucasfilm and Dark Horse Comic during meeting as Skywalker Ranch in 1997 and 1998.
Who remembers reading these series of Legends books? Let me know in the comments below. I read all 19. Favorites were "Traitor" by Matt Stover and "Star by Star" by Troy Denning. i have the hole 16 book set good stuff! I have yet to read any books in the "new canon" that come close to the imagination and creativeness found in these books or any other books in the now "Legends" books. Despite her image being on the book's cover, and pregnant no less, dare anyone even mutter the name Mara Jade (Skywalker) or shall she be completely obliterated from our collective consciousness? Have LFL/Disney not yet discovered this Legend will never die?